Since moving to Boston four years ago, I've met a lot of great friends, and now two of these friends are having a baby! This has been a big year for everyone. Heck a big semester more like it! When I was in Germany this past fall, two couples got engaged AND married while I was gone. Plus, in one month we will welcome what will probably be one of the smartest little boys in Cambridge, if he's anything like his parents. Before I moved to Boston, I lived in Dallas for two years, which despite the heat, was a great experience. In Dallas, it took me about a year before I started making close friends. Then when I finally got to the point where I had really strong friendships, I had to up and leave. While I don't regret living Dallas to move to Boston, I do wish I could have stayed just a little longer. But again, I'm so happy to be in Boston, and I am enjoying being in one place for a while. It's amazing to look back over the past four years and see just how much we've all grown. I know eventually we'll all go our separate ways. In fact, many of us are already starting to move farther out of Boston. I'm just glad that we get to celebrate some big milestones this year! Plus with big celebration comes big knitting projects, so I'm excited about that too. The Gloucester Baby Blanket went on hiatus this weekend as I wanted to make some burping pads for the new baby. We had a big dinner last night as a baby shower, and I wanted to give the expecting couple something hand knitted. This dinner was planned only a few days ahead of time, so I needed to knit something fast. I've had this Lily Sugar'n Cream Stripes around forever, but never knew what to make with it. 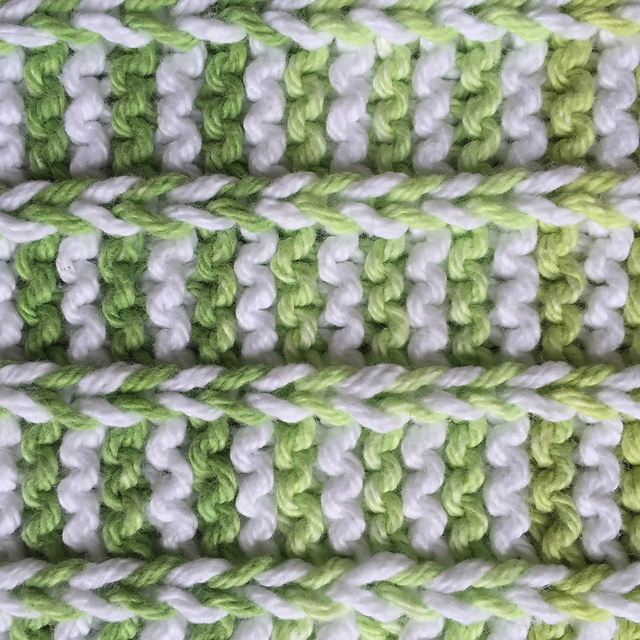 I like the idea of the striped colors, but when I did a swatch, I just didn't like how abrupt the color change was. In an attempt to go cold sheep and eliminate most of my yarn stash, I perused projects on ravelry made with the same yarn. That's when I found this project. She used two colorways of the striped yarn, denim and lime, and I loved the finished look. Using the two colors really broke up the striping, making the color changes more gradual and less harsh. I only had the lime colorway, but I did also have solid white. So with these colors in hand, I casted on some Baby Genius Burp Cloths on Friday night. Now, the only bummer about this pattern is that it's not available online. 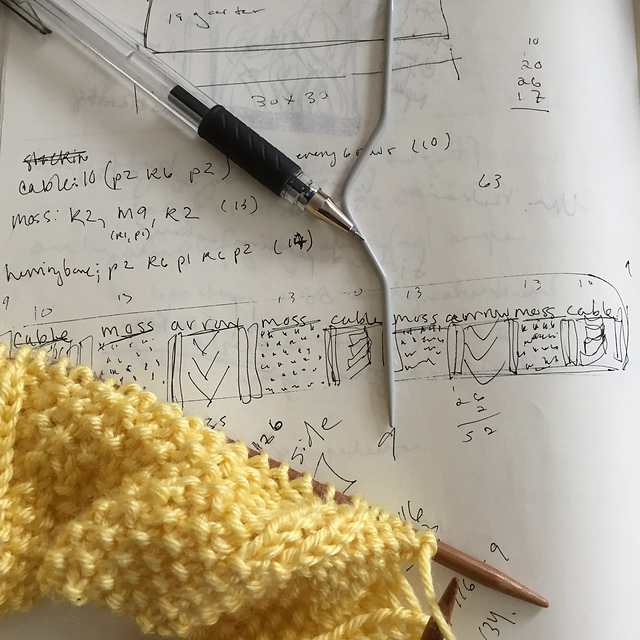 Luckily, the Brookline Public Library has a vast collection of knitting books, including the book where the pattern is from, Mason-Dixon Knitting. The impressive collection of knitting books at the Brookline Public Library! 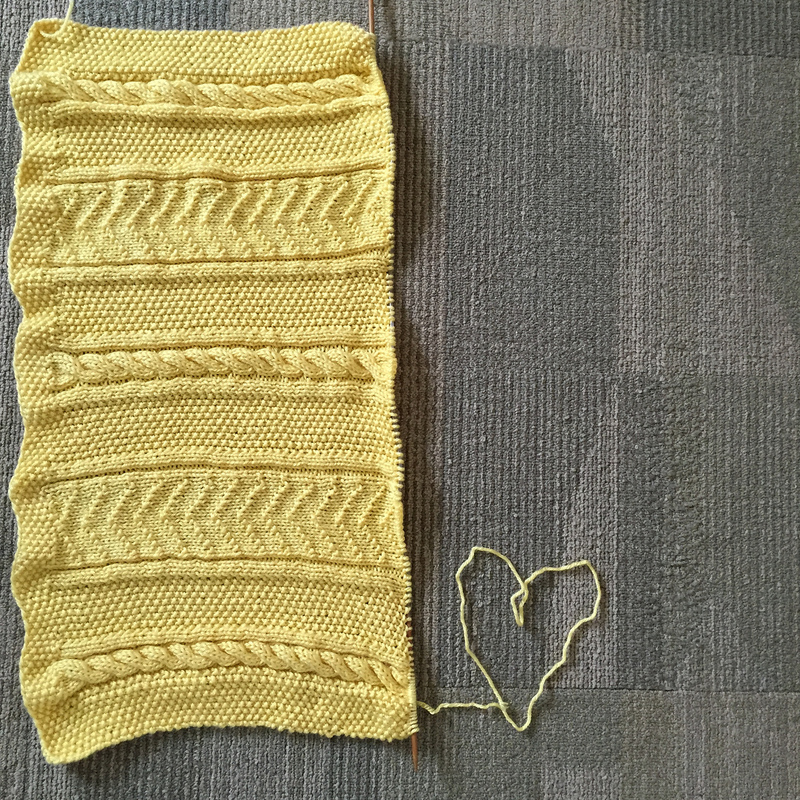 Despite being a simple pattern, it required a lot of attention while knitting. Despite my doubts, I managed to finish all three in time! I took every chance I could to knit, even during a Boston College hockey game on Friday night and a long walk through the garden on Sunday night (aka during several episodes of The Wire). Last home game of the season for the Boston College hockey team. Go Eagles! For the rest of week, I will focus on finishing the Gloucester Baby Blanket. I hate letting projects hibernate for too long. Here's to hoping it'll be an FO in the next post! Finally! Some reprieve from the snow and harsh cold. Its sad when 24 F is considered warm. I'm still working on the Gloucester Baby Blanket, but I haven't made noticeable progress. Although I am almost finished skein #2. I haven't decided how wide I want to make it yet, and I should probably decide that soon. I know most baby blankets are squares, but I like more rectangular blankets to wrap myself up in. I don't know what babies like though, or if they even care for that matter. Anyway, the blanket is coming along, and hopefully it will be finished by the end of the weekend. Besides the blanket, I whipped up two cowls. This first was meant to be broken ribbed hat. After finishing the decreases, however, I didn't like how it looked scrunched at the top. I kept trying it on, pulling at parts of the hat to style it correctly, until finally I looked to Michael (the fiance) with puppy dog eyes and a sad pout, and said those dreaded words, "I have to frog this." Trying to cheer me up, he took the hat and pulled it over his face and said "But it's so warm!". That's when I decided to just rip out the decreases and bind off, turning the hat into a cowl or neckwarmer. Michael and I having some fun "modeling" the cowl. Michael really liked how it turned out, and actually wanted one for himself. He's not much of scarf guy, but I think the jarring windchill has changed his mind. So I made a second one, this time in a dark brown/black color. I used a bulky yarn for the beige cowl, and a worsted yarn held double for the brown one. Michael wearing his new cowl/neckwarmer! CO 72 stitches. Join in round. Be careful not to twist stitches. Repeat rounds 1 and 2 until piece measures 9 inches or desired height. The last should be round 1. Loosely BO in K1, P1 ribbing. Weave in ends and block as desired. Feel free to wear it with either the right side or the wrong side out, as it reversible! Right side is shown at the top, and the wrong side is shown at the bottom. Seriously... this snow is never-ending! Remember when I said I was in no way sick of snow? Well, I changed my mind. Now I'm kind of sick of snow. 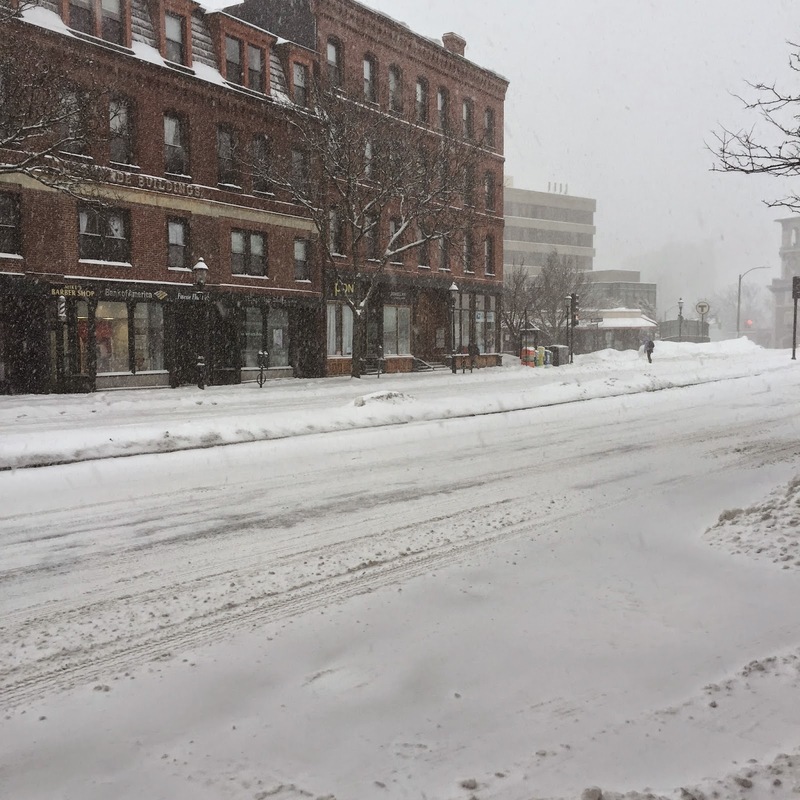 New England is bracing itself for yet ANOTHER blizzard. Neptune I think it is? And on a sidenote, since when have we been naming blizzards? I thought it was just hurricanes... Anyway, Michael and I had plans to venture to Salem tomorrow and spend the day drinking tea, strolling in and out of little shops, and make a visit to a new LYS called Circle of Stitches for their soft opening. Unfortunately, public transportation, which we refer to here as "the T", is officially shutting down from tonight through tomorrow night, making us postpone our day trip. When the T shuts down, there is not much going or doing around Boston. Yes you can walk, but there is already a ton of snow on the ground plus another foot to come, making it quite difficult to walk around unless you have cross country skis or snowshoes -- which people, including my roommate and friends, have actually been doing. I am not a big skier, as in the first and last time I went skiing, I ended the day by faking an injury because I was too scared to go down the mountain and wanted to be sledded down. That means I'll be snowed in at home yet again. Fortunately, I get to be snowed in with Michael, and we will indulge in a day filled with tea drinking, knitting, reading, and foodmaking (my vote is for pizza and tacos) while wearing our flannel pajamas. I guess snow days aren't THAT bad. So I felt very productive with my knitting this week, and I'm hoping to keep that up tomorrow. I'm still test knitting my own pattern for the Gloucester Baby Blanket. This blanket is knit sideways so that "stripes" are horizontal. I am a third of the way done now, and I'm hoping to make some serious progress on this tomorrow. I'm eager to finish so I can finally share the pattern! Besides working on the blanket, I started and finished this Slouchy Fisherwoman's Hat last night. This hat is basically twisted ribbed throughout (K1TBL, P1 repeated), and you can find this very easy pattern here. It was such a quick knit, especially since I used this bulky alpaca yarn I brought back from Germany. I originally made this for the etsy store that my mom and I have called Huber Stitch Originals, but I love it so much that I might keep it for myself and make a few more later on. Well I'm off to catch the T home before this blizzard starts yet again. On a much a lighter note, happy Valentine's day to everyone! Charles Schulz said it best that "All you need is love. But a little chocolate now and then doesn't hurt." He did forget to mention wine though :) Hope your day is full of love, chocolate, wine, and yarn! 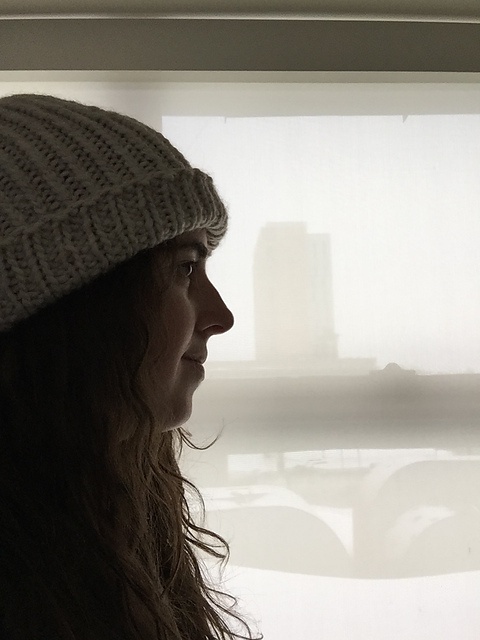 A Never-Ending Snowstorm Means Never-Ending Knitting! For those who haven't been keeping up with the New England weather, we are amidst the most epic and never-ending snowstorm of all time. No exaggeration. Since my last snow day post, we've had three snow days, and it takes a lot of snow to shut down Boston. Most of Boston is exasperated with the weather, but I must admit, I've enjoyed living in a winter wonderland. Fortunately, I can say that because I don't have a car or driveway shovel out, and I have a job that allows me to easily work from home. Plus the snow days allowed me to sneak in a few extra hours of knitting, so I can't complain. Before I get to the actually knitting, I just want to take a second mention two other feats I accomplished this week: stash organization and blocking! These are on my list of bottom 5 knitting activities (along with weaving in ends, grafting, and frogging). Even though I dislike the process of organizing and blocking, the end results are worth it. Here is a test knit for the Hive Mind Cowl that I finished knitting last month. The pattern is not available yet, but when it is, I'll let you all know. It's made out of this bulky alpaca/merino/acrylic blend, and the brioche stitch makes this even softer and squishier. The cowl is a holiday gift for my fiance's friend, but I didn't want to give it without blocking. Now the gift is very late, but I'm so glad I waited. It looks so much better. picked up 4 stitches when working the thumb, then k2tog twice on the next round. Overall I liked how these mittens turned out. To be honest, I have a love-hate-love relationship with mittens. I love how they look, then I hate making the thumb, and then love how they turn out. These will also be a belated gift. One day I will catch up with all of these gifts! This weekend I also started drafting a pattern for a baby blanket, which I will share here once its done. I'm calling it the Gloucester Baby Blanket, as its inspired from an old fisherman's sweater. Now I'm off to get ready for work tomorrow. I almost forget what that's like! What a night! Last night my fiance, Michael, and I watched the Super Bowl at our friend's new house in Southie (South Boston). Needless to say, it was an exciting night and a great game, even for football un-enthusiasts. The only thing I missed out on last night was being able to knit during the game. Football games are usually prime knitting time for me. Right now I am working on a pair of cabled mittens, which requires me to keep a constant eye on the instructions. I try not to pull out those kind of projects in a social setting. A mindless stockinette project is a whole other story of course. The Eugenia Mittens by Mollie Woodworth that I'm working on are for the February Reddit KAL. 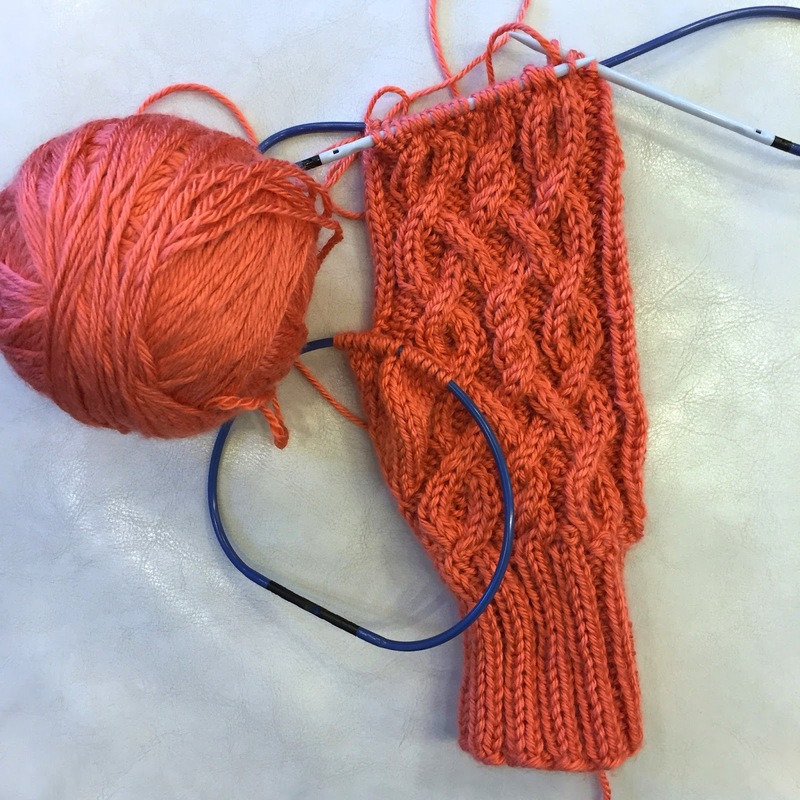 On Saturday morning, I casted on with the a dark Autumn Red yarn and quickly knit up most of mitten. 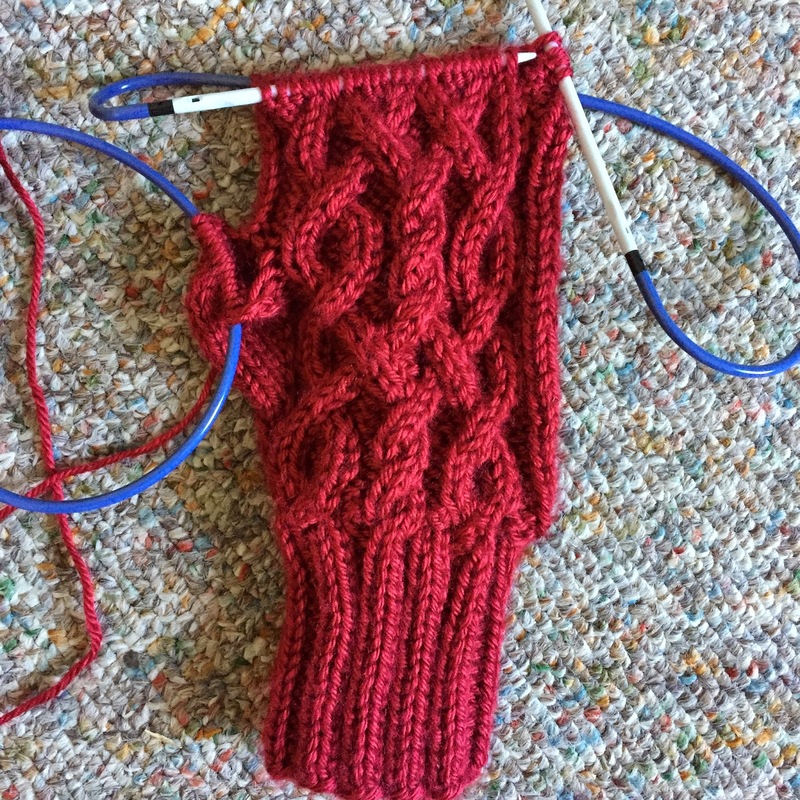 Midway through the Eugenia mitten in Autumn Red. Once I finished moping about it, I casted on again with a light pink yarn. For this project I'm using Caron Simply Soft, which is a super soft and durable, acrylic yarn. Attempt #2 on Eugenia mittens in Persimmon. I toyed around with buying Cascade 220 for this project (Iridescence or Walnut Heather... or both), but I made a strikk New Year's resolution to destash before buying anything new. I have a large stash of Simply Soft thanks to my mom, who recycles the leftover yarn from her crocheted afghans to me. While I would prefer to use natural fiber, I do love the ease of washing and handling acrylic yarn for items such as slippers and mittens as they tend to take a lot of abuse. So far I've finished 90% of one pink mitten, and I love how its turning out. The cable pattern is simple, but looks very intricate when its finished. This would make a great first "learn to cable" project. 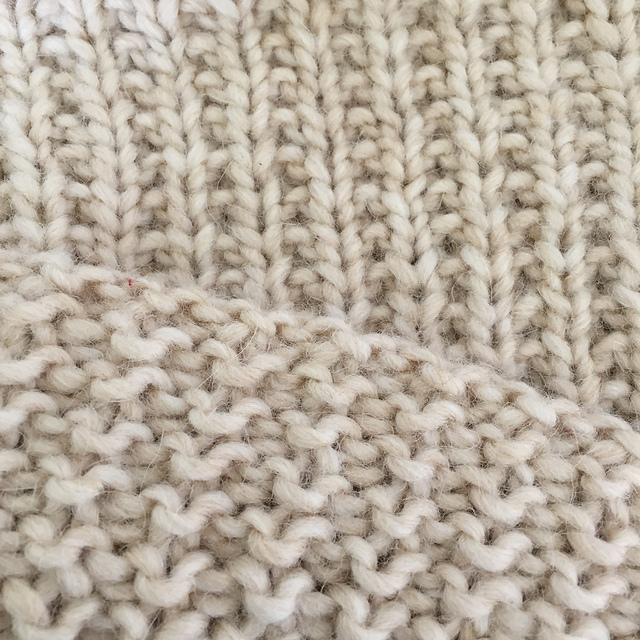 Plus there are two ways that one can repeat the cable pattern to get slightly different looks. If you're following the pattern, I did the 1-16, 1-16, 1-10 cable pattern. Today is actually another snow day in Boston (third day in one week! ), which means besides working from home, I can get in some good knitting time and make some headway on mitten #2. Another beautiful snowfall this morning Brookline Village.